The 4th most populous country in the world, Indonesia has had its share of political problems over the last few years. We made few stops along the way, but are left with the feeling that the people are friendly and kind, curious at times, but not threatening. This huge archipelago spans 45° of longitude - 12% of the way around the world and sits between Australia and our next major destination - the Mediterranean. Having read many of the cruising stories we were prepared for the worst - collisions with fishing boats, inquisitive strangers, and piracy at every turn. As our time to leave Darwin approached, Judi decided to skip this passage and Mark, an Aussie crew member, joined Bob for the 2000 mile trip from Darwin to Singapore. We left in October, late in the season, and can confirm that there is NO WIND in this part of the world during the transition period of Oct-Nov. Fishing boats do come close, but they know what they are doing, and do not want to be run down by a yacht in the middle of the night - so they are not a major worry. Check out our Indonesia Warnings for our latest information. With the situation in Timor still unsettled - violence was at a low level, but a couple of New Zealanders had just been shot in West Timor so we decided not to stop at Kupang, Timor as originally planned. We had contacted Mark's friend via SSB radio (7326 kHz, USB), and arranged to stop at the west end of Roti, a small island to the west of Timor. He ran the Nemberela Resort, a surfing spot with a world-wide following because of well-developed swell from the S Indian Ocean which produces long, smooth rollers. We anchored in a pass in the reef (10° 52.774' S, 122° 48.533' E) about 1/4 mile north of the resort. It felt like being in the ocean with 5000 miles of open water to our stern and 8' rollers on each side! We arrived with the Spring tides and these 2 ladies, along with most of the village, were wading in the shallow water harvesting agar-agar, a seaweed used for food and lab work. We were able to buy diesel fuel, stay the night, and move on at first light. 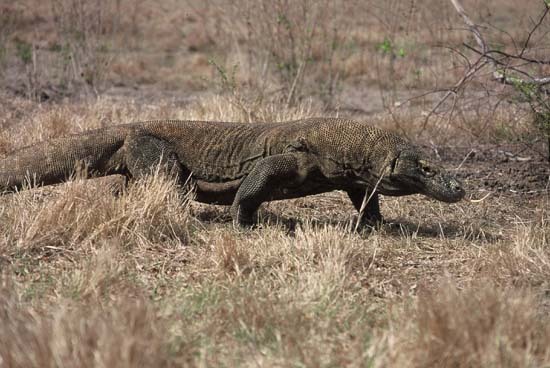 While in Indonesia one 'must see' the Komodo dragons. We anchored in the south between Rinca and Kode islands (8° 47.31' S, 119° 39.42' E) and spotted dragons, deer, and monkeys on the beach during 'sundowner' time. Next day we moved north to the ranger station (8° 39.22' S, 119° 42.86' E) and early the following morning had the ranger-led grand tour to see the dragons, deer, monkeys, and water buffalo. The dragons - at 6' long with a sinister look- are the most impressive monitor lizards we have ever seen! They hunt the water buffalo as well as insects - and man is a potential, although unlikely prey. We found many of the cruisers stopped here for dragon gazing rather than going to Komodo island - across the strait - because the anchorage was better and there were fewer tourists. Our approach to Benoa harbor on Bali was rough - 6-8 foot seas broke as a 4 knot helping current bashed into a 20 knot headwind. The Bali International Marina is run-down and the nearest stores are a $3 taxi ride away, but with all of the services it provides a gateway to a beautiful, crowded island. 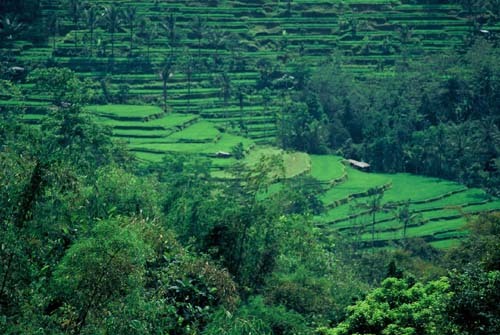 With 3 1/2 million people (same as New Zealand) crammed onto a small island, roads are packed, but escape to the countryside and the vast rice paddies open up as we saw how this island attracts so many visitors. 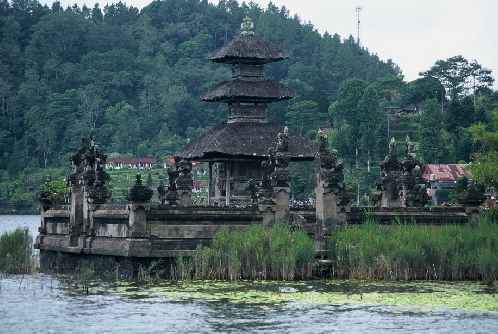 Bali is a Hindu enclave in the middle of a huge Moslem country and its culture was fascinating to us - a temple at every turn, small offerings outside every home each morning, and festivals likely to happen any day of the week. In Ubud, a small town north of Benoa, crafts people sell batik and wood carvings galore and the king's palace hosts a nightly Hindu play of the Ramayana - another 'must see'. We stopped on the west coast for 1 night before our final assault on the Singapore Straits. We anchored near a couple of houses on stilts used for fishing - and to our amazement at sundown families came out in runabouts and towed the houses to deeper water, with a friendly wave for us as they went by. After Indonesia, an easy trip across the Straits to Singapore.